What do you think happened when the medieval European imagination found a new artistic medium? 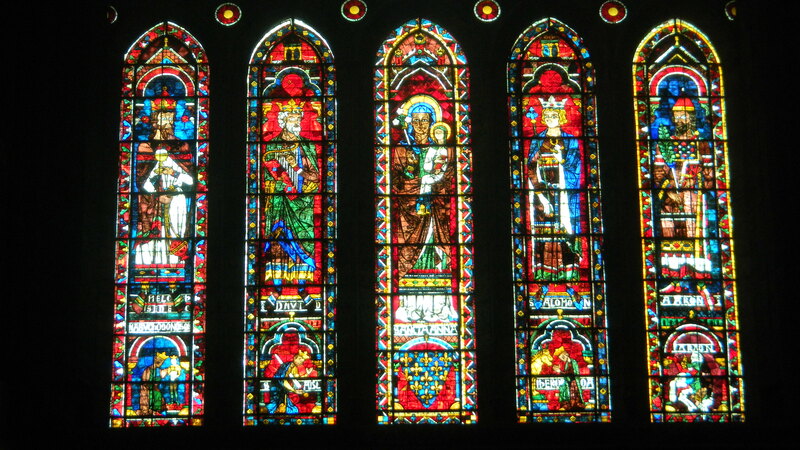 Above is only a minute part of what the builders of Chartres Cathedral achieved. Come inside and we’ll explore one of the world’s finest artistic achievements. Now that Chartres’ builders had raised the height of the church and supported its frame with flying buttresses, they could use most of the wall space to let their imaginations fly. People filled the whole church with Biblical stories in a way that represented medieval views of the universe. Both of the above pictures are from the north transept. 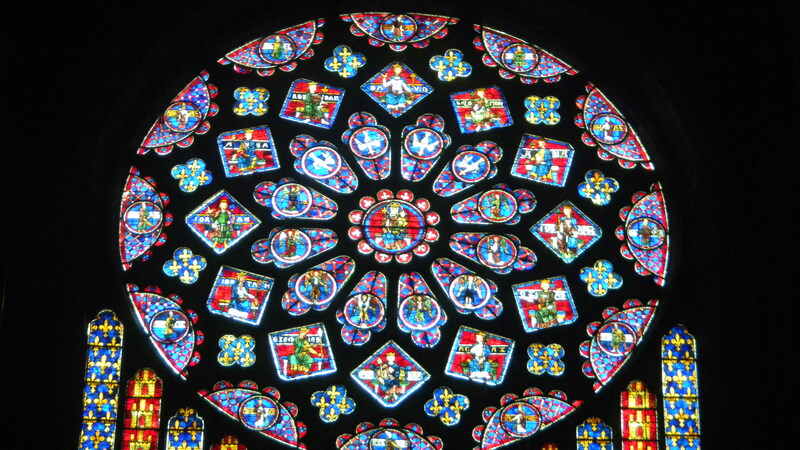 The top photo is just below the Rose Window (the bottom picture). This transept represents the Old Testament, but according to a new vision in the early 13th century, when the widows were made. 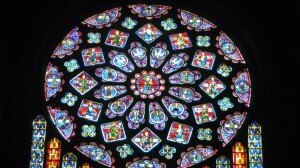 The Rose Window contains conventional Old Testament motifs–12 semicircles surround the 12 minor prophets, and 12 squares house the 12 kings of Judah. But the central figure of the Virgin and Child graces the whole window. Mary’s cult became popular in the 12th century, and she’s represented in this window as the link between the Old Testament and the New Testament. Likewise in the 5 panels below the Rose Window. St. Anne holds the child Mary in the center. They’re surrounded by honored Old Testament figures, including Melchizedek, David, Solomon and Aaron. A few recent posts have explored Islam and its focus on the believer’s direct relationship with God, which should have no impediments. But the West has stressed a human component of divinity. God is perfect, and He created all. The greatest expression of His perfection is His having a son in creations’ likeness to save them from straying from divinity. Muslims consider this idea absurd because it denies God’s uniqueness, but Christians consider this the ultimate expression of God’s glory and love. 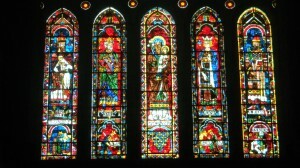 The tall Gothic naves and their enlarged stained glass panels gave Europeans a new way to add human images of divinity. Now that windows filled the whole church, light from this divine family bathed the whole congregation. Mary was a key link from the Old Testament’s demanding God to the New Testament’s loving God. Her central place in the new windows made this idea tangible, and it allowed the divine light reach down to ordinary folks like a mother’s arms embracing her children. Chartres Cathedral’s sculpture honored Mary with equal magnificence.